Gary Sondergaard, Owner, is a third generation electrical contractor. 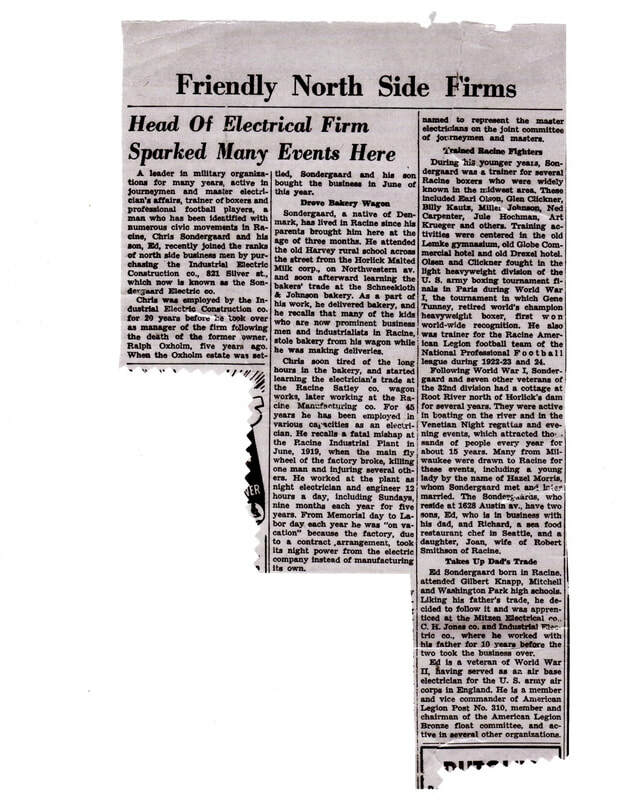 Sondergaard Electric was originally started in 1955 by Christ and Edward Sondergaard, Gary's grandfather and father. The business closed in the mid 1980's due to Ed's retirement. It has always been Gary's dream to re-open his family's company. ​In 2007 Gary did exactly that! Gary Sondergaard is a 3rd generation electrical contractor & business owner. News about us from the Racine Times Newspaper. A leader in military organizations for many years, active in journeymen and master electrician’s affairs, trainer of boxers’ and professional football players, a man who has been identified with numerous civic movements in Racine, Chris Sondergaard and his son, Ed, recently joined the ranks of north side business men by purchasing the Industrial Electric Construction Co., 821 Silver St., which is known as the Sondergaard Electric Co.
Chris was employed by the Industrial Electric Construction co. for 20 years before he took over as manager of the firm following the death of the former owner, Ralph Oxholm, five years ago. When the Oxholm estate was settled, Sondergaard and his son bought the business in June of this year. Sondergaard, a native of Denmark, has lived in Racine since his parents brought him here at the age of three months. He attended the old Harvey rural school across the street from the Horlick Malted Milk corp., on Northwestern av. and soon afterward learning the bakers’ trade at the Schneekloth A. Johnson bakery. As a part of his work, he delivered bakery, and he recalls that many of the kids who are now prominent business men and industrialist in Racine, stole bakery from his wagon while he was making deliveries. Chris soon tired of the long hours in the bakery, and started learning the electrician’s trade at the Racine Satley co. wagon works, later working at the Racine Manufacturing co. For 45 years he has been employed in various capacities as an electrician. He recalls a fatal mishap at the Racine Industrial Plant in June 1919, when the main fly wheel of the factory broke, killing one man and injuring several others. He worked at the plant as night electrician and engineer 12 hours a day, including Sundays, nine months each year for five years. From Memorial Day to Labor Day each year he was “on vacation” because the factory, due to a contract arrangement, took its night power from the electric company instead of manufacturing its own. During his younger years, Sondergaard was a trainer for several Racine boxers who were widely known in the Midwest area. These included Earl Olsen, Glen Clickner, Billy Kautz, Miller Johnson, Ned Carpenter, Jule Hochman, Art Krueger and others. Training activities were centered in the old Lemke gymnasium, old Glove Commercial hotel and old Drexel hotel. Olsen and Clickner fought in the light heavyweight division of the U.S. army boxing tournament finals in Paris during World War 1, the tournament in which Gene Tunney, retired world’s champion heavyweight boxer, first won world-wide recognition. He also was trainer for the Racine American Legion football team of the National Professional Football league during 1922-23 and 24. Following World War 1, Sondergaard and seven other veterans of the 32nd division had a cottage at Root River north of Horlick’s dam for several years. They were active in boating on the river and in the Venetian Night regattas and evening events, which attracted thousands of people every year for about 15 years. Many from Milwaukee were drawn to Racine for these events, including a young lady by the name of Hazel Morris, whom Sondergaard met and later married. The Sondergaards, who reside at 1628 Austin av. Have two sons, Ed, who is in business with his dad, and Richard, a sea food restaurant chef in Seattle, and a daughter, Joan, wife of Robert Smithson of Racine. Ed Sondergaard born in Racine, attended Gilbert Knapp, Mitchell and Washington Park high schools. Liking his father’s trade, he decided to follow it and was apprenticed at the Mitsen Electrical co., C.H. Jones co. and Industrial Electric co., where he worked with his father for 10 years before the two took the business over. Ed is a veteran of World War 11, having served as an air base electrician for U.S. army air corps in England. He is a member and vice commander of American Legion Post No. 310, member and chairman of the American Legion Bronze float committee, and active in several other organizations.